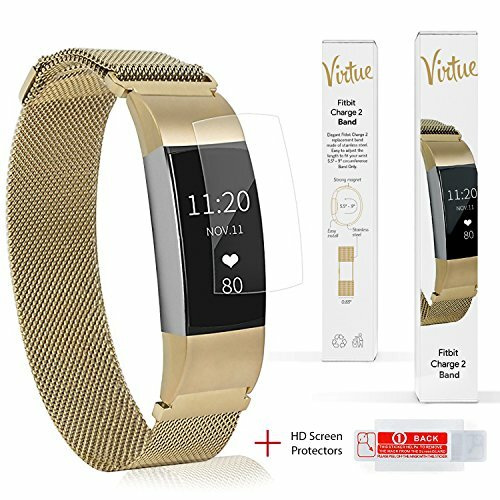 Virtue Product Bands Compatible with Fitbit Charge 2 Gold Milanese Loop-Stainless Steel Metal Bracelet Replacement for Fitbit Charge 2 This Premium Quality Fitbit HR Charger 2 Replacement Gold Watchbands are specially designed to be an absolute companion for your workouts and other casual activities for men and women. It is compatible with Fitbit charge 2. They are fully waterproof. Wrist bands for Fitbit Charge 2 are on offer to accentuate your style and give you the stylish appeal you deserve. HD Screen Protector Film designed specifically for Fitbit Charge 2 for perfect protection on touch screen. Buy elegant Fitness Bracelet Charge2 gold band made of stainless steel. Easy to adjust the length to fit your wrist 5.5" - 9" circumference Band Only. The Fitbit Charge 2 Calorie Tracker Heart Rate Monitor is not included. If you have any questions about this product by Virtue Product, contact us by completing and submitting the form below. If you are looking for a specif part number, please include it with your message.